Chester boss Mark Wright and assistant Graham Barrow have left the club. Wright parted company with Chester in August 2004 but returned for a second spell as manager in February 2006 and led them to League Two safety. Barrow was appointed as Wright's number two in May 2006, Barrow had previously been in charge at the Deva Stadium on two previous occasions. Youth team manager Simon Davies has been appointed caretaker manager for the final game of the season. 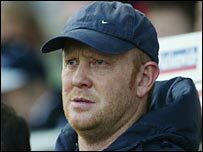 Wright had agreed a new two-year deal to remain in charge at the Deva Stadium back in 2006 but has now left the club.